Many fairy tales end with lovers starting a new future together that the phrase "fairytale ending" is practically synonymous with weddings. 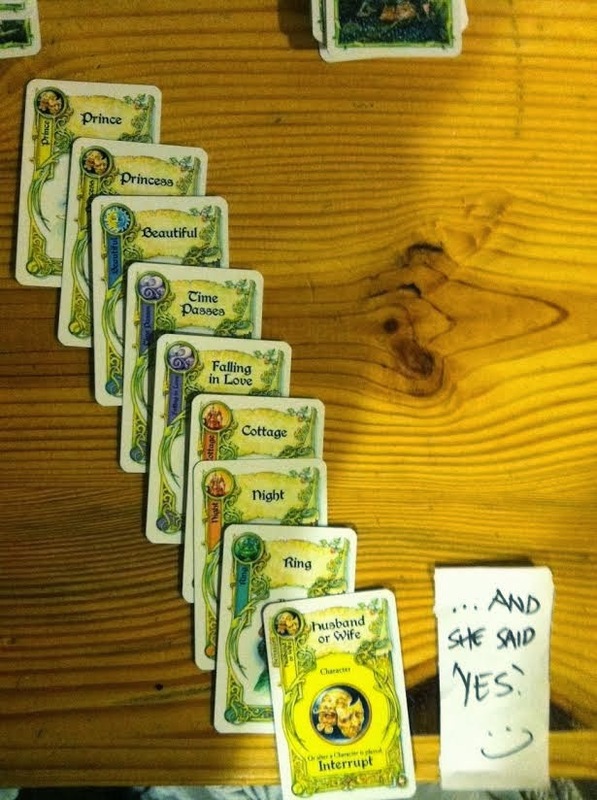 So we were enchanted to receive the story of a real-life marriage proposal using Once Upon A Time 3rd Edition cards! "We were camping together last weekend and while I wasn't looking, Ben "stacked" the deck for Once Upon a Time. He planned what he was going to say ahead of time and made sure I had a tough deck so I couldn't interrupt him. Midway through his spread of cards, it was clear to me that something magical was happening. He bought the game for me for Christmas and was planning that night for some time." And while they may have played all their cards, it's clear that their magical adventure is just beginning. Everyone at Atlas Games wishes the happy couple the very best! That is a beautiful thing! Congratulations! !